The play Australia Day by Johathan Biggins opened at the New Theatre in Sydney last night. This is a loving, humorous and at times bighting look at local politics. Anyone who has been on a committee to organize a community event will recognize the characters and situations. 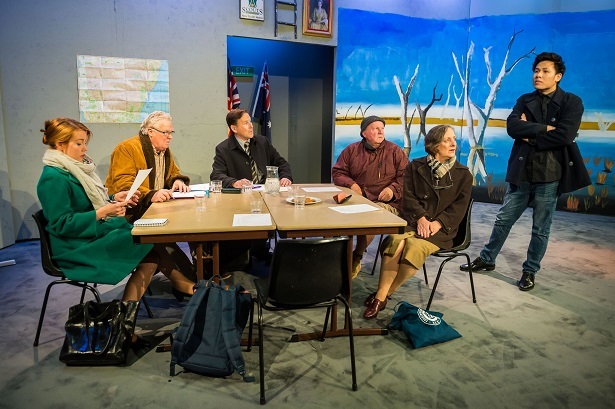 Set in the scout hall of a fictional Australian inland town, the play tracks the progress of the committee organizing Australia Day celebrations. Along the way issues of race and identity, politics and corruption and explored. This is leavened with humor and the playwright's obvious affection for the characters. David Marshall-Martin's set evokes the austere, slightly tattered atmosphere of an old scout hall, complete with photo of a very young Queen Elisabeth and slightly tatty flags. Alice Livingstone was clearly enjoying herself as "Maree Bucknell", one of the quirkier characters of the committee. Louise Fisher's costume design for Amelia Robertson-Cuninghame, as a greens politician was a little too glamorous to be believable. But the way Amelia says "its nothing personal" while blackmailing a fellow politician was chillingly real. She would make an excellent addition to the cast of "House of Cards", now they have a vacancy. At last nights performance I was a little in awe happening to sit next to a New York theater critic making notes in a battered spiral notebook. I was explaining for my amateur how in my blog reviews I try to find a popular work to relate the play to. The obvious film to equate "Australia Day" to is "Rats in the Ranks", Robin Anderson and Bob Connolly's fly-on-the-wall documentary of the 1994 Leichhardt Council Mayoral elections. But while covering many of the same themes, Australia Day is a lot more fun.